Description: Innovative new bails that offer a fast change of your favorite charms. 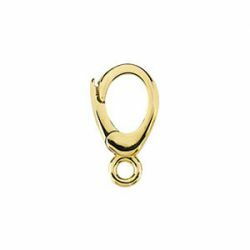 Customize or build your charm bracelet by snap locking bails for quick attachment and removal. The easy to open clasp snaps securely closed and offers the highest degree of changeability. Offered in 14k white, yellow gold or sterling silver. Measurements: 12.0x6.6mm. Measurements are noted for the outside diameter including jump ring for the entire length. Inside diameter of bail is 8.5x4.5mm. The jump ring has an inside diameter of 1.2mm.